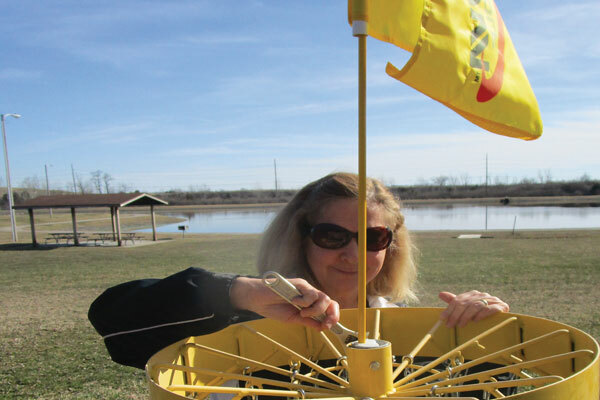 Moraine Rotarians and many volunteers from the Volunteer Program recently installed wind direction flags on the baskets on the 18 hole Rotary Disc Golf Course at Deer Meadow Park. Thanks to a matching grant from Rotary District 6670, Moraine Rotary purchased the flags which not only aide the participant to gage the wind direction but also helps in seeing the basket (hole) in the distance when teeing off. Look in upcoming issues of the Moraine Messenger for free disc golf introductory lessons provided by Moraine Rotary where beginners will be provided discs and be taught how to play.